Deeply affecting personal journey. A great video discovery if you missed it in the theater. Worth seeing for Harris' performance alone. Should play well on video. Ed Harris is an amazingly honest actor. Whether he's playing a megamaniacal military rogue (like in "The Rock"), an egomaniacal TV producer ("The Truman Show") or an everyday dad ("Stepmom"), he so fully understands his characters' foibles and drives that he taps right into the cores of their beings. It's not so much that he's a chameleon who disappears into his parts, as it is that he visibly enjoys becoming the people he plays. There is a rapture in the way he performs that is just a joy to watch. In the complex, compelling and intimate "The Third Miracle," Harris plays Father Frank Moore, a disillusioned Catholic priest who debunks miracle claims for the church -- a man whose psyche has become scarred with hesitancy and regret after years of shooting holes in people's beliefs. This is a complicated role for the actor -- which is probably why he leaves such a deep impression from the first moment he's on screen. This priest loves God, it's in his eyes (they're a window to the soul, you know), but he's not sure anymore that his work is a service to his Lord. Although he still embraces and personifies Christian ideals, he's in a deep crisis of faith -- which is why the film first finds him semi-retired and living among the soup kitchen set. But Moore may have found his personal salvation in his case for the canonization of Helen O'Regan (Barbara Sukowa), an illiterate, Chicago nun whose favorite statue of the Virgin Mary cries blood every year around the anniversary of her death. Desperate to rediscover his wavering conviction after years of doing his job so well he's become known as "The Miracle Killer" among his peers, Moore latches onto proving this woman a saint as a way to make up for his past of ecclesiastical muckraking. Directed by Agnieszka Holland ("Washington Square," "Europa, Europa") and adapted from Richard Verete's novel of the same name, "The Third Miracle" follows Frank Moore's intricate path of doubt and rediscovery as he becomes more and more convinced that this woman was an instrument of God. The film's gritty personal journey is complimented by its mystery-like atmosphere, as the priest investigates two claims of miracles performed by Sister Helen -- the healing of a cancer-afflicted little girl (who has since grown up into a trampy teenage junkie), and the act of faith that opens the film in a grainy flashback: When this nun was a little girl herself, she had lived in Czechoslovakia during World War II, where bombs literally disappeared from the skies over her village upon young Helen's prayer on the steps of her church. The discovery of this inexplicable act, proves both wondrous and frustrating for Moore, as he can find no living witnesses and making his case isn't proving easy anyway. Temptation stands in his way, in the form of the Helen's agnostic daughter (Anne Heche) who taps into his doubt and his desire. 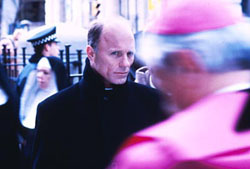 Road blocks are thrown up by a prejudiced and skeptical Cardinal (Armin Meuller-Stahl), who dismisses the faith healing with an arrogant sniff and hounds on the fact that this woman virtually abandoned her daughter when she gave her life over to the church (which explains Heche's faithlessness, but not her thrift shop fashion victim wardrobe). Harris plumbs the depth of Frank Moore's ardent but conflicted soul. He's is tapped into the character's convoluted beliefs that lean away from loyalty to the church and toward direct loyalty to God. He follows his heart and his instincts, even to the point of giving money from a collection box to the hard-luck girl Helen once healed, who soon thereafter falls into a coma after being savagely beaten in a drug deal gone bad. The fact that the girl has strayed so wildly from Christian ideals is something the powerful and pompous Cardinal latches on to in angry debates with Moore during hearings on Sister Helen's sainthood that ring with the tension of a courtroom drama, thanks to director Holland's firm grasp on the moods throughout the film, which she accents with dark colors, exploring close-ups and a moving soundtrack rich with the finesse of plaintive string bass. "The Third Miracle" has its flaws. I doubted the priest's rather rapid surrender to temptations of the flesh with Heche (if it weren't for his white collar, one episode might have played like any conventional Hollywood love scene). And hyper-sensitive Catholics might want forewarning that it doesn't show the church in the best light (although it's considerably less blasphemous than the irreverent "Dogma" or "End of Days," in which Arnold Schwarzenegger locks horns with the devil). But it does portray the personal pursuit of faith in a way rigidly organized religion practically prohibits, and Harris demonstrates that pursuit in every nuance of dilemma and revelation in this, his career-best performance.